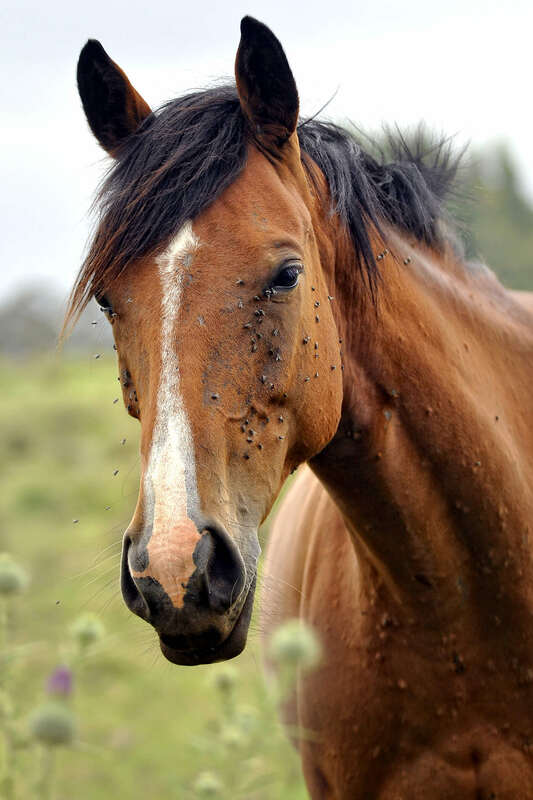 Mosquitoes can be enormous pests to our horses, but even worse, they may spread diseases [disease-causing pathogens] like West Nile virus or Eastern and Western equine encephalitis (EEE and WEE). As horse owners, our goal is to minimize our horses’ exposure to mosquitoes and their risk of being bit. This can sometimes feel like a losing battle, but attacking these insects on multiple fronts can make a big difference in your horse’s well-being. As the famous phrase says, “an ounce of prevention is worth a pound of cure,” and the best place to start eliminating exposure to mosquitoes is around the barn. A good way to control mosquitoes is to eliminate the larval development sites on your property. Mosquitoes require stagnant water for larval development, so addressing areas with slowly moving or stagnant water is a good place to start. If you have a pond on your property, adding a fountain or filter will help keep the water moving, or consider introducing koi fish to stir the water and eat the mosquito larvae. Some local mosquito control programs will provide fish for free or at a low cost, so be sure to check with your local cooperative extension. You can also greatly cut back on mosquito larvae by dumping out water tubs and buckets at least every 3 days, discarding any old tires or other junk that might be holding water, and positioning your drainage system to ensure water isn’t collecting anywhere. While plants won’t kill mosquitoes or mosquito larvae, they may help repel them by releasing odorous oils. Some plants, like marigolds, basil and lavender have odors that help keep mosquitoes away. Plant them in window boxes or planters near your barn and doorways to keep mosquito traffic to a minimum. Screens and fans can aid in mosquito control by blocking or blowing mosquitoes from the barn. While screens may not be practical for many barn set-ups, fans can be strategically placed in aisle ways or on stalls to help airflow and blow bugs away. Another way to combat your mosquito population is through the use of larvicides. Areas of standing water can be treated with products containing a bacterium called Bacillus thuringiensis israelensis (Bti) or S-methoprene (an insect growth regulator), like Pre-Strike® Mosquito Torpedo® larvicide tablets, which attack and kill mosquito larvae. Bti and S-methoprene won’t harm humans, animals, fish or vegetation when used as directed. You can find these products at your local home & garden stores in various forms. Many towns will spray mosquito adulticides in the late summer if cases of EEE or West Nile virus begin showing up. Unfortunately, horses are sentinel animals, meaning they are typically the warning sign to the community that West Nile or EEE is present; therefore, towns don’t typically take action until after a horse has contracted the virus. In addition to the environmental aspect of mosquito control, it’s also important to minimize your horse’s contact with mosquitoes. Keeping your horse inside during dawn and dusk hours when mosquitoes are most active can be helpful in preventing contact. Utilizing insect repellents, such as Ambush® Insecticide & Repellent, on your horse is also a very effective way to reduce exposure to mosquitoes. A study from the University of Tennessee shows some of the most effective repellent chemicals are pyrethrins and pyrethroids, such as permethrin. Pyrethroids are synthetic variants that mimic the natural insecticidal properties of plant chemicals and can be combined with a synergist like piperonyl butoxide (PBO). PBO prevents flies and mosquitoes from detoxifying the pyrethrins and pyrethroids (which keeps knocked-down mosquitoes from later recovering), thus increasing their effectiveness. Choose a repellent spray that best suits your horse’s daily routine. If you wash your horse after daily workouts, it may not be advantageous to your pocketbook to use a long-lasting spray, as you will be washing it off every day. If your horse is in daily turnout or lives in a pasture, you may want to opt for a product that includes a coat conditioner or sunscreen to protect the coat and skin, or an equine spot-on that provides up to 14-days protection. 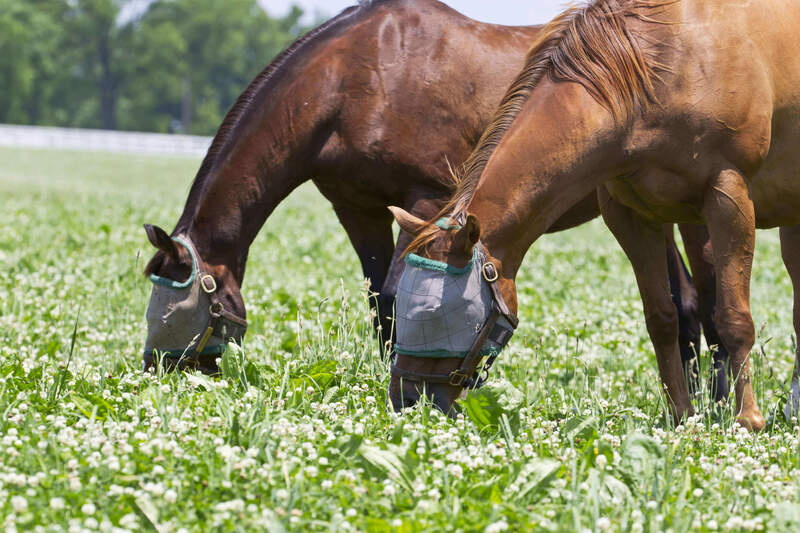 Fly masks, fly sheets and fly wraps are also effective barriers to keep flies and mosquitoes away from horses. There are several different types of masks – ear protection, nose protection or sun protection – to choose from, so choose the mask that best fits your horse’s needs. Be aware that some of these products may use chemical repellents to deter pests. Some horse owners have also had luck repelling insects by adding natural ingredients to their horse’s diet, such as garlic and apple cider vinegar, claiming that they make your horse less attractive to bugs, including mosquitoes. Note that most of these products are not under any regulation, so it is a case of buyer beware to some extent. It is virtually impossible to keep your horse completely mosquito-free during the warm weather, but with some forethought, planning and actions to prevent and repel them, you can keep your local mosquito population to a minimum.